ECR RO Tobey 418, an ET brother to the top seller, was the second high seller at $35,000. ECR RO Tobey 424 ET fetched $50,000. Location: at the ranch near Ree Hights, S.D. Prospective buyers both video and present were anxious to see the bulls and females offered by Fawcett's Elm Creek Ranch the morning of Feb. 9, 2015 as their third annual sale was set to begin. The top two bulls were members of the Reserve Champion Pen of Three from the National Western Stock Show. 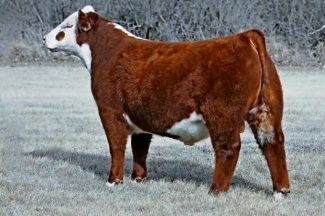 The high seller of the day was a polled ET Hereford yearling bull selling as lot number 23 for $50,000 to buyers Perez Herefords of Nara Visa, New Mexico, Barber Ranch of Channing, Texas, Morgan Ranch of Burwell, Nebraska, Houston Herefords of Texas and Werk Herefords of Kansas. The March 18, 2014, UPS Sensation son posted a weaning weight EPD of 58, yearling weight EPD of 97, Milk EPD of 97 and his M & G was an impressive 55. Lot 22 was a flush brother to the high seller and brought $35,000. 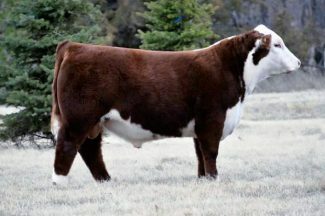 Blume polled Herefords, Beck/Powell Polled Herefords and Brant Herefords joined forces to own this powerhouse. His EPDs matched those of lot 23 and his adjusted weaning weight was 766 pounds. Lot 0 was a late entry in the sale but proved to be worthy of the competition for the top spot bringing $25,000 and selling to Carswell-Nichols Herefords of Alton, Kansas. The top 2 year old bull went to Empire Ranch of Moorcroft, Wyo. for 8,000. Registered bred heifers averaged $7,500 on the day with top seller Lot 125 bringing $10,000 and selling to Perez Cattle Company. Lot 129 sold to Ollerich Brothers for $9,500 and lot numbers 128 and 127 both sold to William Wihelm for $9,000 and $4,750, respectively. The high selling yearling heifer went to Lane Peterson from Holabird, South Dakota, for $7,000. Number 143 sold for $5,000 to Hexad Farms. Eighty head of first cross black baldy yearling heifers sold for an average of 2001. Lot number 186 brought forth seven head who brought $2,275 and went to Three Brothers Farms of Odgen, Iowa. Lot 186A brought $2,200 and went to Joe Mamer of Canby, Minnesota.